In my life I have met two types of people. 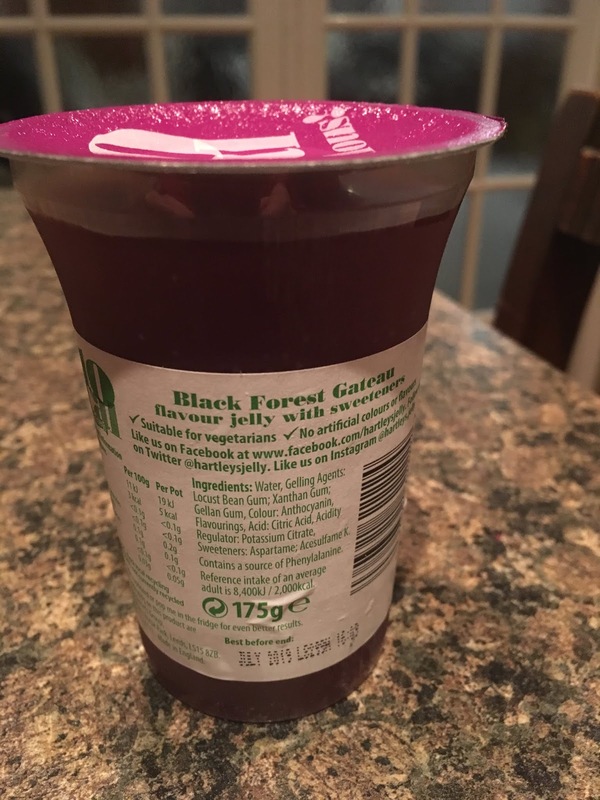 There are those that like jelly and ice cream in the same bowl, and those that like jelly or ice cream in a bowl on their own. I'm a jelly or ice cream kind of person. Don't get me wrong, I do like jelly and I also like ice cream, just as long as they don't meet in the same bowl. Now you'll be able to tell which type of person you are by determining how crazy I sound. If I should perfectly reasonable, then you are not a jelly and ice cream in the same bowl type of person either! Cinabar asked me why I choice to try this jelly. "You don't even like Black Forest Gateau!" She exclaimed. It's true I don't particularly like cherries for a start, which doesn't help with liking the cake itself. Many years ago whilst staying in Lumley Castle, near Newcastle Upon Tyne, there was nothing on the pudding menu I liked, but I went for the bowl of cherries, because it came with shortbread. I figured it would be a tiny bowl of cherries with some biscuits on the side. I'm telling you that I never seen such a big bowl of cherries in my entire life! On opening this 175g plastic pot there was an unsurprising and yet also unsurprisingly unwelcome smell of cherries. This chilled deep red almost liquid jelly smelt of Maraschino cherries, and strangely a little creamy. I wasn't particularly fussed by tasting it at this point, but this is what us hardy bloggers have to do, so I reluctantly dug a spoon in. The only thing that tasted more of cherries than this jelly was the monstrous bowl full that I started and almost threw up at Lumley Castle. I couldn't really pick up on any chocolate flavour though. 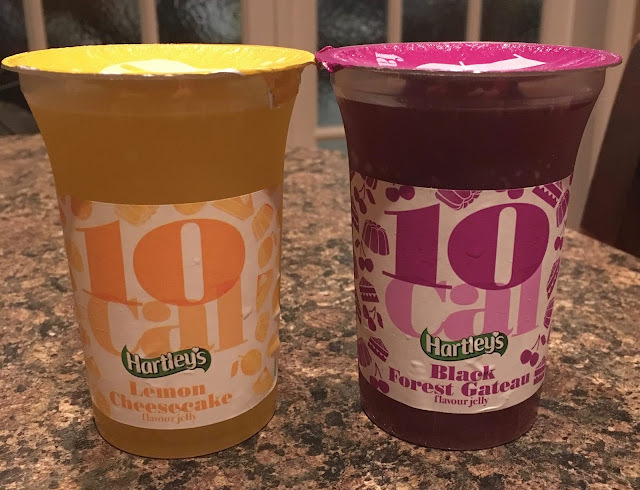 Although there was a slightly odd taste of cream at the back of the flavour, which didn't bode well with my half crazed jelly or ice cream persona. Before you say it, yes, with the whole jelly or ice cream ideology this is probably not a good idea! However, I do love lemon cheesecake, unless, of course; it's baked! There are two types of people… Oh, never mind… I just don't like baked cheesecake! Anyway, even Hartley's would have a job on baking jelly flavoured with lemon cheesecake. Surely? On opening the pot there was a decent smell of lemon. This was to be expected for a Lemon Cheesecake Jelly. In fact if I almost stick the pot up my nose I would say it does smell of lemon cheesecake, and not the baked variety. Phew! 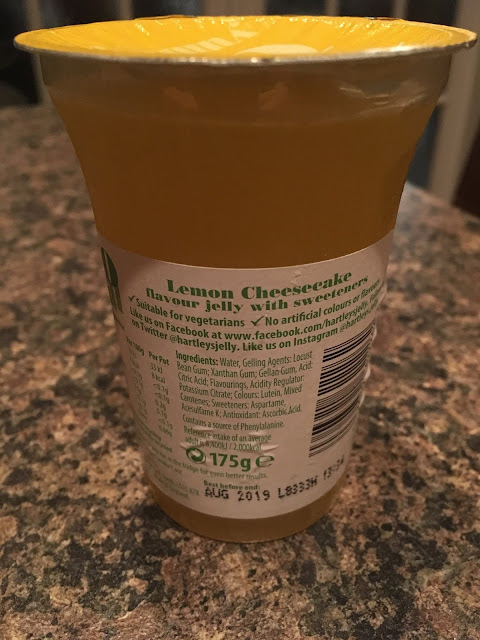 There is that creamy flavour again after a initial fairly sour taste of lemon. Here the creamy flavour is more pronounced, however it does actually taste pretty good… well, if you like that sort of thing! I'd certainly say that this was my favourite out of the two jellies… Mainly because no matter how many cherries a hotel can try to force feed me, I'm just never going to like them!